Lucknow: Even as Samajwadi Party president Akhilesh Yadav and his father Mulayam Singh Yadav have vacated the government bungalows, the Uttar Pradesh government is set to send second notices to Bahujan Samaj Party supremo Mayawati and former chief minister Narain Dutt Tiwari to vacate their government bungalow, allotted to them as former Chief Ministers. The state government's move came after both the leaders gave their excuse not to vacate their bungalows, even after notice was served to them a fortnight back, on the direction of the Supreme Court. Ms Mayawati claimed that she has already vacated 6, Shastri Marg Bungalow, which was allotted to her as former Chief Minister, and had sent the keys through courier, but the state Estate department said that 13-A Mall Avenue, which the BSP claims as Kanshiram Yaadgar Vishramalaya, is the bungalow allotted to her.UP government has also ordered a probe on the government letter shown by the BSP chief on the allotment of 6-Shastri Marg bungalow, as it was a fake one. Officials said here on Saturday that the copy of the allotment letter R-7183/32-2-2011-2010/2008 issued on December 23, 2011 given by Ms Mayawati was fake, as the original allotment was made through this reference to a government employee Rekha. "Government has ordered a probe to find out the employees involved in the fraud," the official said, adding that second notice would be sent to Ms Mayawati to vacate 13-A, Mall Avenue bungalow immediately, as per the Supreme Court ruling. Former Chief Minister Narain Dutt Tiwari too has not vacated his bungalow yet and the family members have put a board of a Trust in front of the bungalow after the notice to vacate the house was served to them by the state government. Tiwari's family has also sought one year time to vacate it, but the state government was not ready to consider any plea and the second notice is set to be issued soon. 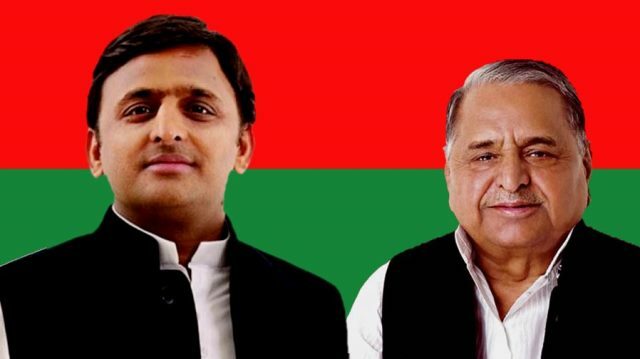 Meanwhile, Samajwadi Party president and former UP chief minister Akhilesh Yadav and his father Mulayam Singh Yadav, who had sought two years time to vacate their government bungalows in Lucknow, have decided to shift to private accommodations in the state capital, immediately. Mr Mulayam shifted to a VVIP guest house on a temporary basis late last night, while Mr Akhilesh and his family will also move to the VVIP guest house on Saturday. The process of transporting truck-load of household goods to the new accommodation of Akhilesh and his father, which commenced on Wednesday night, was completed on Friday night.While Akhilesh is vacating his 4, Vikramaditya Marg bungalow, his father is leaving the adjoining bungalow. Both the father and son are shifting to separate private bungalows in the outskirts of the city. Akhilesh has sent an application to the state Estate department, to allot him four suites in the VVIP guest house, for temporary shifting of his family members. The deadline to vacate the two properties will expire on June 3. SP Sources said the call to vacate the bungalow was taken in wake of the 15-day notice that the state had served on Akhilesh, Mulayam and others on May 17, as per a Supreme Court order. Akhilesh had already announced that his house is under construction on the Vikramaditya Marg and till then, he will stay in a rented house. However, the move is surprising, as they (Mulayam and Akhilesh) had moved a petition in the Supreme Court, seeking more time to vacate their government bungalows. But it was reported that SC refused to entertain it. Union Home Minister Rajnath Singh and Rajasthan Governor Kalyan Singh have already vacated their bungalows, which had forced the SP leaders to follow suit. Earlier, Mr Mulayam had met Chief Minister Yogi Adityanath, to allow him to stay in the bungalow for some time more, but he refused to help, in view of the Supreme Court directive.